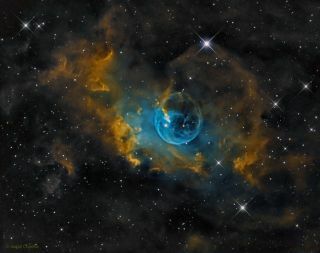 This image of the Bubble Nebula was taken by astrophotographer Jaspal Chadha from London. This interstellar apparition has a surprisingly familiar shape. Known as the Bubble Nebula, the cosmic circle is formed from the wind of a massive star. This spectactular photo was taken by astrophotographer Jaspal Chadha from London. Chadha used a Altair Astro RC 250TT Scope. Editor's note: If you have a night sky photo you'd like to share for a possible story or image gallery, send images and comments in to Space.com at spacephotos@space.com.